What is the Nine Days Menu at Kosher Restaurants? Talia’s Steakhouse is Talia’s Fish House for the following nine days: begin in the evening of Thursday, July 12th and ends in the evening of Saturday, July 21st. For over 16 years, Talia’s is serving a NINE DAYS MENU. To view the Nine Days menu, click HERE (menu subject to change without notice). The Nine Days menu includes an assortment of seafood, pasta, and other vegetarian cuisine. Feast on delicious Moroccan salmon, stuffed peppers, sesame seared tuna, Chilean sea bass, falafel & more. Talia’s regular dinner menu is available as well. Many kosher restaurants are NYC create a special menu, called “The Nine Days Menu”. This menu includes fish and vegetarian options, replacing meat and chicken dishes from the regular menu. Kosher restaurants in Manhattan and other places in the world that usually serve kosher meat and wine, create a Nine Days Menu in order to remain open, since eating meat and drinking wine during these days is not permitted according to Jewish laws and customs. The Nine Days take place during the first nine days of the month of Av, which usually fall out around July or August. It is a religious observance and according to the Talmud, “When Av begins, we diminish rejoicing” (Talmud, Taanit 26b). Both the first and second Temples were destroyed on Tisha B’av. The first Temple was destroyed in 586 B.C.E. by the Babylonians and the second Temple by the Romans in 70 B.C.E. These tragic events have been mourned throughout Jewish history and observed by fasting. We mourn both the loss of the Land and the spiritual center of Jewish life by being in exile. In keeping with the diminished enjoyment, the last nine days of the three weeks are more stringent with the mourning aspect, including refraining from haircuts, shaving, listening to music, eating meat, and any other entertaining activities. During this time, many Jews mostly eat dairy, fish or pareve products. For Kosher restaurants NYC, this may pose a bit of a problem, especially if you are a kosher steakhouse in Manhattan. As a kosher restaurant, what can we do when many of our clientele cannot eat any meat for more than a week? At Talia’s Steakhouse, a Manhattan glatt kosher restaurant on the Upper West Side, the regular menu featuring kosher burgers, steak, wraps, etc. is always available. For those who observe the restrictions of the Nine Days, Talia’s Steakhouse, for over ten years, has been accommodating guests with a unique and special Nine Days menu which contains a large selection of gourmet fish, pasta and vegetarian dishes. Talia’s Steakhouse becomes Talia’s Fish House. While there are plenty of meal choices, live music will not be available during the entire Three Weeks. Just because meat is prohibited during The Nine Days, does not mean that Manhattan kosher steak houses need to shut their doors for that time. 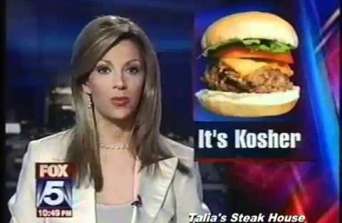 A Manhattan kosher restaurant such as Talia’s may have between 15-20% non-Jewish customers who can enjoy prime rib. The Sephardic custom is to not eat meat and drink wine only from the Sunday before Tisha B’av. Many Yemenite Jews only refrain from meat starting the day before. Furthermore, meat and wine are permitted on Shabbat and for seudot mitzvah, such as brit milah. One may have meat during these days if required for health purposes, such as an anemic person, pregnant woman or someone who just gave birth. It is always wise to ask your Rabbi about the laws and customs during this period if you have any doubts. Nowadays, kosher restaurants in Manhattan still have plenty of non-meat dishes that they can serve to customers. So, BON APPETIT!